Windows 10's cumulative updates have ballooned in size, and a similar bloat will also affect the Windows 7 updates that Microsoft revamped this month. 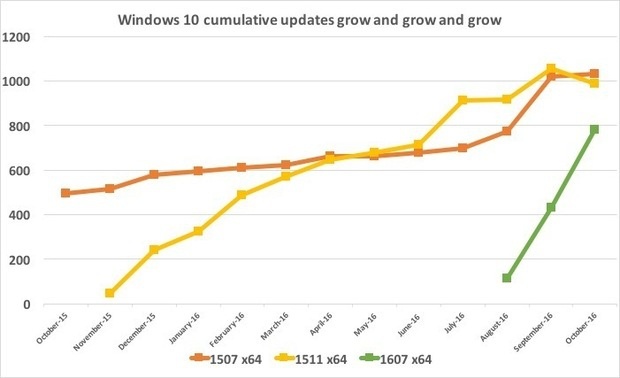 According to data published last month by LANDesk and refreshed by Computerworld with October's numbers, Windows 10 cumulative updates for the three versions of the new OS have surged in size. Updates for Windows 10 version 1507 -- the debut that launched in July 2015 -- have grown 153% (for the 32-bit edition) and 181% (64-bit), from 184MB and 368MB to 466MB and 1,034MB (or over a gigabyte), respectively, in just over a year. Those for version 1511 -- Windows 10's first "feature update," issued in November 2015 -- exploded in comparison: The first 64-bit 1511 update was 49GB, but the cumulative update released earlier this month was a whopping 989GB, for a growth rate of 1,918% in under 12 months. The newest Windows 10, version 1607 -- released in early August -- has also expanded, with the 64-bit edition climbing 591% from 113GB in August to 781GB this month. "Cumulative updates start out big and become enormous over time," Stephen Brown, director of product management at LANDesk, a maker of enterprise endpoint management software, wrote in a post to a company blog on Sept. 21. Windows 10's updates have ballooned for good reason, said Rex McMillan, a LANDesk principal product manager, in an interview today. "With Windows 10, the cumulative updates include both security updates and feature updates," noted McMillan. "Under Microsoft's 'We build it as we go' [model], the percentage of files that have to change is really high. They're touching a high percentage of the code." The more changes, the larger the update, in other words. The only thing that keeps Windows 10's cumulative updates from swelling to unmanageable enormity is that at each edition's release, the size "resets" to some degree. In November 2015, for example, the original Windows 10, version 1507, received a 515GB cumulative update. But those who had upgraded to version 1511 earlier that month were handed an update of just 49GB. Version 1607's first update was 119GB, a fraction of 1511's 917GB or 1507's 776GB that same month. Large updates may not be a pain point for all customers, but to those with low-bandwidth connections to the Internet, or people on metered connections, where every bit and byte are tallied by the provider or carrier, massive downloads can be a deal breaker. And while the increasing size of Windows 10 cumulative updates does not affect everyone -- about a fourth of Windows users are running 10 -- Microsoft recently expanded the cumulative concept to Windows 7, the operating system that powers nearly half of all personal computers worldwide. In fact, Microsoft expects that Windows 7's updates, like those for Windows 10, will get bigger. "The rollups will start out small, but we expect that these will grow over time to something close to the convenience roll-up size," said Nathan Mercer, a Microsoft product marketing manager, in the August announcement of the change to Windows 7's update scheme. The "convenience roll-up" Mercer mentioned was about 477GB in size (for the 64-bit version). Microsoft issued the roll-up in May. In another answer, Mercer got more specific. "Eventually [the Windows 7] Monthly Roll-up will grow to around the 500MB size," he said. If Windows 7's updates were to grow at the pace of 10's, the former would top the roll-up within a few months: Using the expansion of Windows 10 1511's updates as a guide would mean Windows 7's cumulative update for April 2017 would be approximately 1.6GB, or more than triple Mercer's bet. That's not likely, said McMillan, for the simple reason that Microsoft is not fiddling with Windows 7 features at this point, but instead patching vulnerabilities and fixing bugs. McMillan predicted that the Windows 7 cumulative updates would reach Mercer's 500MB estimate, probably within a few months, but then grow from there only slowly. But even updates of that size will choke some customers. 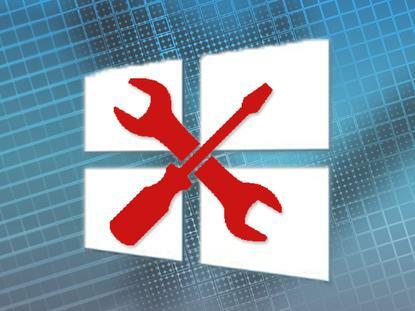 A few users and IT administrators expressed concern about the expanding updates as soon as Microsoft announced the new servicing regime. "This may impact bandwidth to download and install," wrote someone identified as Kiran in a comment appended to Mercer's August blog post. McMillan has been fielding similar inquiries from LANDesk customers. "I'm getting multiple calls each week about bandwidth," he acknowledged, referring to the Windows 7 cumulative updates. "A lot of them just don't have a fat pipe, so this is an entirely new problem for them." McMillan cited retailers and healthcare organizations as examples of users with limited Internet bandwidth -- some with nothing more than dial-up connections, others who rely on satellite-based Internet -- who will face time-consuming downloads as the cumulative updates grow in size. Previously, updates could be individually selected -- each security patch or hot-fix approved or rejected by IT administrators -- to fit the specific needs of each system, resulting in small-sized downloads. But with the all-or-nothing nature of the new Windows 7 cumulative updates, those users were suddenly locked into taking everything Microsoft offered, or leaving machines vulnerable to attack. Windows users would have had to deal with the cumulative concept at some point -- when they migrated to Windows 10 -- but the change to the Windows 7 servicing rules put it front and center months or years earlier than many figured. "This will have a huge impact," McMillan said. "[Users] are having to make choices they haven't had to make before." Windows 10 cumulative updates have ballooned in size as code changes accrete. Version 1511's latest update was more than 20 times larger than its first update just 12 months ago.